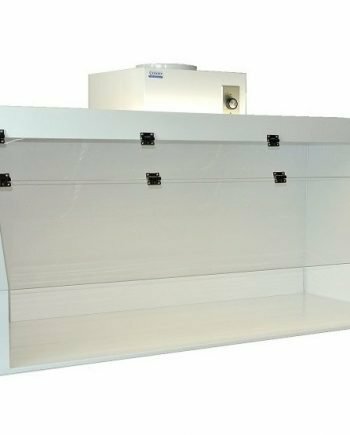 Polypropylene Fume Hoods from Cleatech are excellent chemical resistant laboratory safety hood designed for high corrosive applications such as acid handling and they are protecting laboratory workers when working with toxic chemicals, vapors, gases, dusts, flammable and hazardous materials. The chemical fume hoods are total exhaust system require ductwork. They are available with and without bottom work surface and in variety of sizes from 24” to 96” length. The single walled construction provides maximum work space. External lighting make it explosion & spark proof unless it equipped with blower module. (Blower is optional, is not explosion proof nor rated for acid and corrosive chemicals). 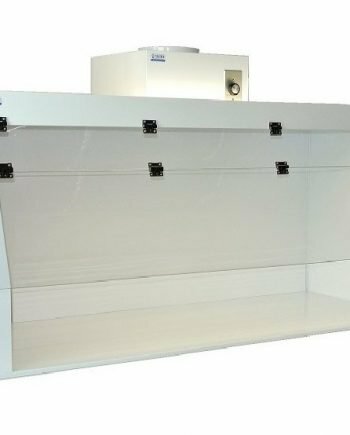 Laboratory safety chemical fume hoods are one of the most important engineering controls in a lab. Click on the fume hood product codes to see the datasheet or request a quote. Choose the Duct or the Fan module from the table below. 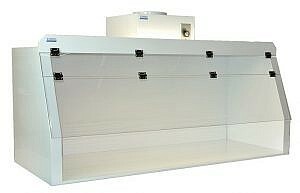 * Up to two duct ports /fan modules can be ordered for the fume hoods depends on the width of hood. Blower Module: Adjustable Speed, Backward curved impeller 480-CFM, Permanently lubricated, Automatic reset thermal overload protection, 120VAC, 60Hz, Polypropylene or Stainless Steel Housing. Electrical: 120VAC/60Hz; consumes 165W; Meets the requirements of the National Electrical Code and applicable local codes. All components UL listed and CE marked. Stainless steel ducted hoods, ESD safe, good chemical resistance to wide range of reagents. Ventilated chemical hoods, polypropylene construction with fan / HEPA filtration for pharmaceutical and powder handling applications.